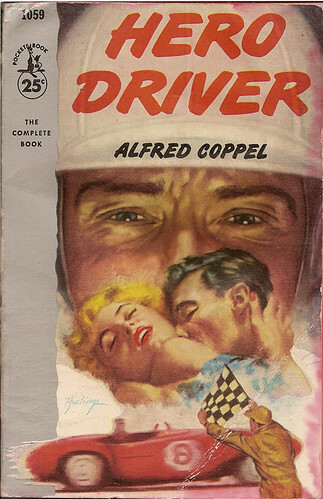 Keeping up with the 50s kick, here’s Hero Driver, a 1955 novel by Alfred Coppel. The cover is by someone called Hastings, who does a fine job. I really like the typography on this cover as well as the composition in general (note how the car breaks the left color panel). Simple and very effective. Alfred Coppel is best known as a science fiction writer. His career began in 1947 and continued through 1993 with the Glorywing Cycle trilogy for Tor (Glory, Glory’s War, Glory’s People). By the time Coppel wrote Hero Driver well into his career, five years after the appearance of his praised short novel The Rebel of Valkyr in Planet Stories. In 1974, Coppel got a best-seller with his non-genre suspense thriller called Thirty-Four East about the Arab-Israeli conflict. Perhaps because he did not want to follow up a mainstream bestseller with a science fiction book, Coppel’s most famous genre work followed shortly thereafter. The book, The Rebel of Rhada, is an expansion and significant improvement of the similarly titled Planet Stories novella from 1950. Three additional Rhada books followed, all under the same “Robert Cham Gilman” pseudonym. Coppel deserves a wider modern audience. His stories are electrifying and fun, and I suspect Hero Driver is one hell of a read.